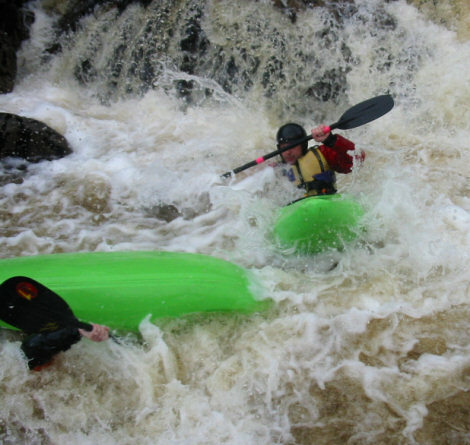 The Flesk RiverJam, County Kerry. 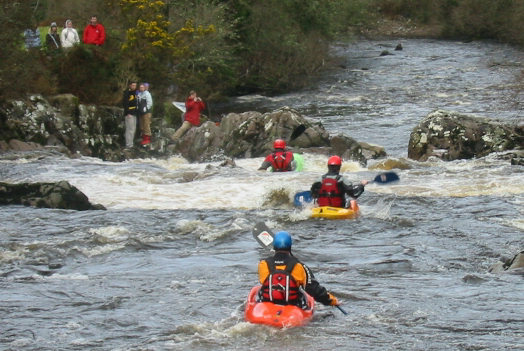 The first Flesk RiverJam took place on 30th of December 2006. 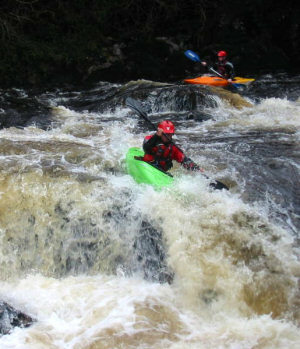 And kayakers from around the world were eager to take on the challenge. Hopefully the first of many RiverJam events, the day ran smoothly with all competitors giving it loads and enjoying their time. The first race was amongst the countries juniors. Showing some exceptional skills they had a super final of 5 competitors giving it all in a race to the end. The crowd enjoyed fine racing but would have to wait for further races for the carnage they desired as these guys were all looking to be first across that line. Dave O Sullivan took first place followed closely by Tomas O'Donoghue and Conor Bredin. Next was the University Team event. Five Universities raced on the day showing the onlooking boatercross competitors what lines were good, and more so what lines to avoid. During the course of this race, teams had to perform two tasks in order to receive time bonuses. The first task was making an eddy with the second, moving from this eddy for a pop out in a small hole. It was highly enjoyable to watch this race and eventually Leeds university came out on top followed closely by DCU. Next up was the Sports events. Mens sports and Ladies Sports. Here we saw some great races with some of the carnage the crowd were hankering for thrown in. It also showed that even on a tough stretch of water such as this, that once race mentality kicks in, competitors seem to just forget about obstacles and go for that finish Line. Mens sport was won by Anthony O'Sullivan followed by Brian Fennel and Eoin Hurst. Womens sport was won by Edel Quinn followed by Mary Butler. Next up was womens expert with some impressive races and an even more impressive final. The day was moving on and water levels still showed no sign of dropping making for some interesting runs and a great final which was won by Michelle from Leeds University, second Jackie Ferguson, and third was Edel Quinn who was bumped into womens expert after winning the womens sports class. The mad dash towards the gates. The final event of the day was the mens expert. There was obvious banter and rivalry between all competitors which meant there was a great atmosphere for the length of this category. Competitors were working so hard to move through the heats the each race was over in no time. Grabbing, pulling and wrestling was the order of the day as racers were doing everything possible to come out on top. It all came down to an impressive four man final at the end of the day, slightly delayed by one racers quivering bowels( you know who you are ). All four racers shot down the course fighting for first, but Dave Crerar seemed to own it from the start. Louis Kelleher seemed to be the closest the whole way and gained second at the line. There was an impressive fight for third between Colin Wong and Moe Kelleher towards the end with Colin eventually grabbing it. Subbing out at the S bend. All in all, great success and a good platform to plan the next event around. A big thanks must be given to all those who helped on the day. Timekeepers and admin helpers, all those who offered any help with setup, and most importantly those who provided rescue, the event could not have run without ye. Mickey, and a "liberated" Christmas decoration from the pub. 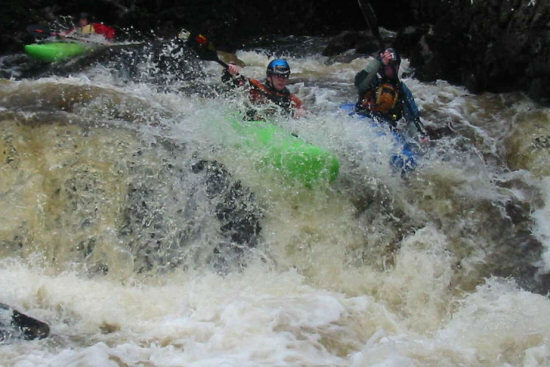 Hopefully this will encourage more people around the country to organise whitewater races, who knows, in years to come we might have an Irish whitewater league.